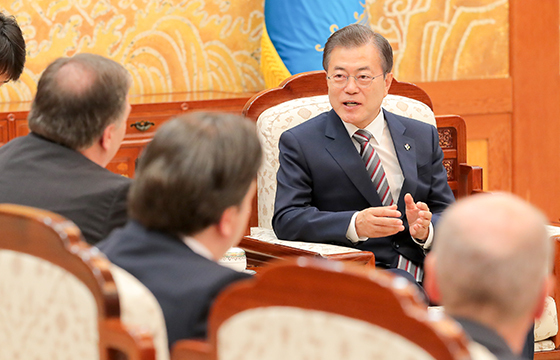 South Korean President Moon Jae-in will meet with heads of foreign companies doing business in Korea, the first time he is reaching out to foreign businesses during his nearly two years in office. About 40 executives from foreign corporations would be invited to the Blue House for talks with the president on Mar. 28, according to business industry sources. Since early this year, Moon has held a series of get-togethers with local business leaders from major conglomerates to small enterprises and startups in an effort to personally hear the challenges facing the corporate sector. This is the first time for him to extend such an invitation to foreign companies. The American Chamber of Commerce and European Chamber of Commerce in Korea said they have submitted their attendee lists to the Blue House for approval. The business huddle is expected to be centered on the deregulation agenda, tax benefits for foreigners and management difficulties surrounding changes in labor policies. Last November, the five foreign chambers of commerce in Korea came together and issued a joint statement calling for eased regulatory standards and tax reforms, the first time for foreign businesses to rally around a deregulation platform against the Korean government. Foreign companies have long taken issue with Korea’s myriad regulations that they argue are out of step with international standards. Korea stood 51st out of the 67 countries on the FDI Regulatory Restrictiveness Index, according to the Organization for Economic Cooperation and Development. The country also ranked 79th among 138 countries when it came to burdensome government regulations based on the World Economic Forum’s global competitiveness index for 2018. The American Chamber of Commerce in Korea was set up in 1953 immediately after the Korean War with a mandate to foster trade and investment between the two countries. As the largest foreign chamber in Korea, it now has over 900 member companies including IBM, FedEx, United Airlines and Lockheed Martin. Founded in 2012, the European Chamber of Commerce in Korea has 330 member companies including BMW, Mercedes-Benz and Diageo.